On a global scale Northern Ireland, despite being a mere 0.00001% of the land area of planet Earth, presents an opportunity to study an almost unparalleled variety of geology in such a small area (P948088). The diverse ages of the rocks present in Northern Ireland is illustrated in this book by the contents menu. Their stratigraphical record commences in the Mesoproterozoic and includes representatives in all of the systems up to and including the Palaeogene (P947913). 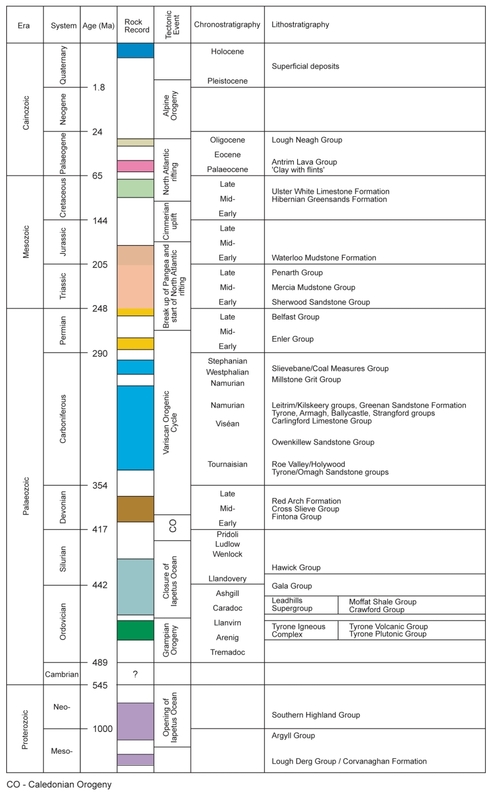 If the Cambrian age attributed to upper parts of the Dalradian Supergroup in Scotland is substantiated then it is likely that their correlatives in Northern Ireland will fall within that system. 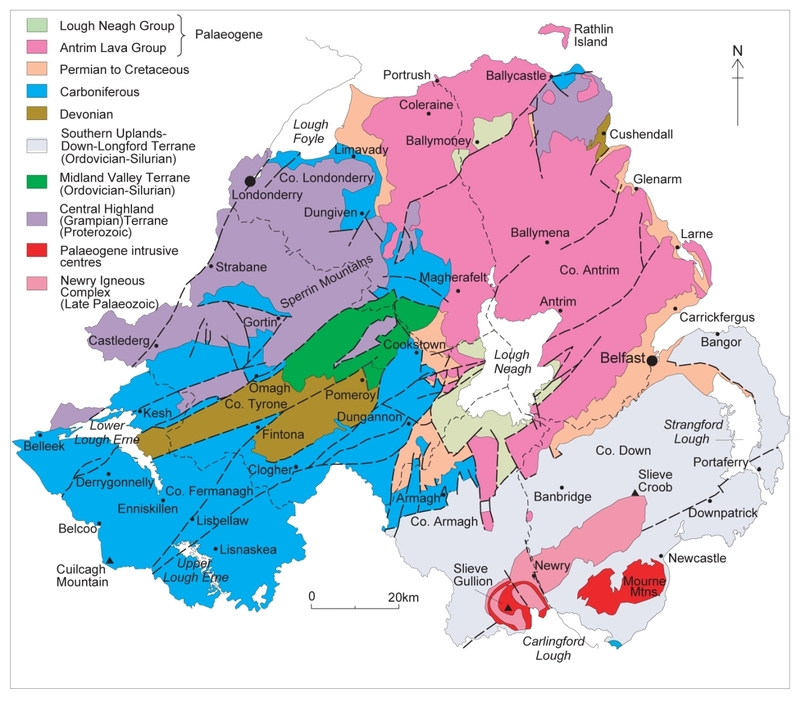 Geology does not stop at political boundaries and the 1:250 000 geological map demonstrates the continuity of major geological structures and lineaments that dominate the geology of Northern Ireland into the Republic of Ireland. The distribution of the geological units described in the book is depicted on the revised edition of the 1:250 000 scale geological map of the northern part of Ireland, which was published in 1997. The book largely describes the geology of Northern Ireland constituting the six counties of the ancient province of Ulster and including Antrim, Armagh, Down, Fermanagh, Londonderry and Tyrone. However, it also includes a description of the Palaeogene Carlingford Complex which, although occurring entirely in Co. Louth in the Republic of Ireland, is one of three, closely spaced, intrusive complexes that together form the cross-border topographical and cultural heritage region of Mourne, Gullion and Cooley. If one envisages Northern Ireland without the cover of late Palaeozoic and younger rocks then the basement is partitioned into areas that represent remnants of three major terranes (see Basement structure and the terrane model article). Commencing some 600 million years ago (Ma) the continents, of which the rocks forming these terranes are representative, were distributed around the ancient Iapetus Ocean. The effects of plate movements through time carried the continents across the Earth’s surface, gradually closing the Iapetus Ocean. Thus, some 400Ma, those terranes came together during the Caledonian Orogeny as one continental mass,which included Ireland and Britain. The oldest rocks in Northern Ireland, the Meso- to Neoproterozoic Moine and Dalradian supergroups, which constitute the northern terrane, form the Sperrin Mountains and extend westwards into Co. Donegal (see Central Highlands (Grampian) Terrane - metamorphic basement article). They are also exposed in an inlier in northeast Co. Antrim and from there extend northeastwards across the North Channel and form the Highlands of Scotland. The central terrane is an extension southwest into Ireland of the Midland Valley Terrane in Scotland. Basement rocks of this terrane are superbly exposed in the Tyrone Igneous Complex (see Midland Valley Terrane article), unlike in Scotland where they are everywhere concealed by Devonian and Carboniferous rocks. Isolated inliers of highly fossiliferous Ordovician and Silurian sedimentary rocks occur at Pomeroy and Lisbellaw and correlate with contemporaneous rocks in eastern North America and the west coast of Scotland. The history of the formation of the southern terrane is one of the most controversial issues to influence the geological history of Ireland and Britain. The Ordovician and Silurian rocks are disposed in an accretionary prism and are a southwesterly continuation of the Southern Uplands of Scotland into Counties Down and Armagh in Northern Ireland (see Southern Uplands-Down-Longford Terrane article). When the younger Phanerozoic cover rocks are superimposed on the basement complex it is evident that Northern Ireland can be divided into four areas with quite distinctive geological characteristics, and ages of rocks that are not usually found in any of the other quadrants (P948089). The northwest quadrant is composed of Dalradian rocks, the early Ordovician Tyrone Igneous Complex and late Ordovician-early Silurian Pomeroy Inlier. The southeast quadrant is composed of Ordovician and Silurian rocks of the Southern Uplands-Down-Longford Terrane with younger intrusive complexes. The southwest quadrant is composed largely of Carboniferous rocks and a Devonian component. The northeast quadrant has Palaeogene basalt lava and lacustrine sedimentary rocks of the Antrim Plateau at surface and is underlain by rocks of Permian to Cretaceous age. Permian, Triassic, Jurassic and Cretaceous rocks form a narrow outcrop at the margins of the plateau (see Permian article), (see Triassic article), (see Jurassic article), (see Cretaceous article). For the first time in the structural history of Ireland, sedimentary basins, and in particular those of Permian and Mesozoic age, owed their formation and orientation not to the reactivation of underlying Caledonoid basement structures but to the opening of the North Atlantic Ocean (see ost-Variscan deformation and basin formation article). While structural preservation of these rocks is partly responsible for their present distribution, their relatively soft nature compared to older rocks made them more susceptible to erosion, particularly during the Pleistocene glaciations. Although Permian and Triassic rocks are exposed on all sides of the Antrim Plateau, detailed information on their relative ages, lithostratigraphy and physical properties is only known from deep boreholes. Late Permian and Mesozoic sedimentation in Northern Ireland appears to be continuous and changes from deposition initially of red-bed sedimentary rocks with infrequent marine incursions to an open marine environment in the Early Jurassic when most of Ireland may have been submerged (see Triassic article) and (see Jurassic article). 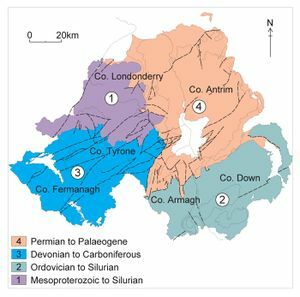 The Cimmerian uplift affected Northern Ireland from Jurassic into Early Cretaceous times and restricted the deposition of greensand and chalk to the Late Cretaceous (see Cretaceous article). In early Palaeogene times Northern Ireland was part of the North Atlantic Igneous Province and came under the influence of the Iceland Plume. However, the earliest vestiges of magmatism are not found at the base of the lavas forming the Antrim Plateau but in the thin, reddish-coloured bed of clay that intercedes between the chalk and the lava, known as the Clay-with-Flints. Formerly believed to consist of a residue derived by weathering of the chalk and to represent a fossil soil or palaeosol horizon, analyses have revealed a volcanic origin for much of the clay component (see Cretaceous-Palaeogene (K-T) Boundary article). The overlying basalt lava forms the Antrim Plateau and is responsible for protecting the underlying softer rocks from erosion. The lava flows were produced by volcanic activity related to the Iceland Plume and in addition to being formerly more extensive were probably considerably thicker than their present 800 m (see Mantle plumes, ocean spreading and the North Atlantic Igneous Province, Palaeogene extrusive igneous rocks article). Early Palaeogene intrusive igneous complexes are restricted to the Carlingford, Slieve Gullion and Mourne Mountains centres (see Palaeogene intrusive igneous rocks article). They individually form separate areas of mountainous terrain and, though related in time, each has a different petrogenetic history. Minor intrusions, particularly basic dykes, intrude all older rocks in Northern Ireland and are related to the extrusion of the basalt lavas. At the end of the period of basaltic volcanism, mid- to late Palaeogene uplift and faulting segmented the lava pile. The final events in the tectonic history of Northern Ireland are related to the formation of Oligocene sedimentary basins that formed on the basalt lava plateau in response to episodes of dextral strike-slip faulting. The remnants of these basins may be of huge economic significance for Northern Ireland in that they contain significant reserves of lignite (see Late Palaeogene (Oligocene) sedimentary basins article). In the late Pleistocene in Northern Ireland, the final 100 000 years of our history, the impact of global climatic cooling resulted in the advance of continental glaciers across northern Europe and Ireland and Britain. At least 80% of bedrock is covered by deposits left by the ice sheets and their meltwater, and by younger Holocene deposits such as alluvium and peat (see Quaternary article). It is at this stage in the history of Northern Ireland that Man arrived and his impact on the environment, and in particular on the natural vegetation, is recorded in those Holocene deposits. The final five chapters in the book commence with an outline of the deep structure of Northern Ireland (see Geophysics and concealed geology article) and link this with a history of hydrocarbon exploration and the prospects of finding accumulations of oil and gas (see Oil and gas article). The history of mineral exploration in Northern Ireland concentrates on the search for gold deposits but also provides an introduction to the availability and types of bulk minerals (see Mineral resources article). For a long time it was believed that Northern Ireland lacked significant reserves of fuel minerals. The discovery of almost 1 billion tonnes of lignite in three separate Oligocene basins has highlighted the importance of this indigenous fuel for the future. Although it is often said that it never seems to stop raining in Northern Ireland the importance of groundwater to the economy and the quality of life cannot be overestimated (see Hydrogeology article). The final chapter in the book describes a range of geological hazards that occur in Northern Ireland and offers a note of caution that future development should be cognisant of risk associated with geology. This page was last modified on 25 September 2017, at 13:32.